On October 31, 2008, Satoshi Nakamoto had a vision to share with the world — a protocol he called “bitcoin, a new electronic cash system that’s fully peer-to-peer, with no trusted third party.” Since that time a whole lot has changed, and there is a vast cryptocurrency landscape with over 1,500 virtual currencies listed on data feed websites. It’s been a very long time since Satoshi left the community and his vision, the white paper, and even the protocol’s proof-of-work has been questioned multiple times over the years. Satoshi Nakamoto left the community in 2010, and no one has heard from the anonymous creator of bitcoin ever since. At the moment the bitcoin community has split into two factions due to the scaling debate, that coincidently started the same year Satoshi left. Many bitcoin cash supporters believe the BTC side of the community has never had a valid excuse against raising the 1 MB block size by utilizing a refuse to give in at-any-cost mentality. The bitcoin cash community believes this group has been so stubborn that Core supporters basically enabled blowback to occur this past August, allowing a large majority of users to go their separate ways by forking the protocol, before the introduction of the contentious Segregated Witness (Segwit). The protocol Segwit had been and still is controversial and hasn’t gained much traction even to this day. All of these individuals who once shared similar visions with their peers, formed another community and rallied around the bitcoin cash (BCH) network believing that BCH is the closest chain to Satoshi’s original vision. A slide from Dr. Peter Rizun’s speech at the Future of Bitcoin conference shows just one reason why people find Segregated Witness unfavorable. Alongside all of this vitriolic energy tethered to the scaling debate, BCH supporters say there have been quite a few individuals who believe “Satoshi’s vision doesn’t matter,” and actually have the audacity to propose making changes to the creator’s white paper. Many individuals will tell you the reason for this is because supporters of the Segwit chain have realized that the document does not apply to the BTC network. Unfortunately, BTC hardly resembles what is described in Satoshi’s white paper. For instance, the co-owners of Bitcoin.org, ‘Theymos,’ and ‘Cobra Bitcoin’ among others have talked about changing certain phrases in Satoshi’s paper. Another example is how the web portal Bitcoin.org, which is heralded by Core supporters as ‘truth,’ removed the cheap and fast transactions description for bitcoin off the front page — the reason for this is because the description does not apply to Core network. The owners of Bitcoin.org have discussed editing and revising the white paper on multiple occasions. Bitcoin.org removes certain descriptions from the front page. The front page has been replaced again with the 2010 definitions and the website’s co-owner Cobra thinks it is a good idea to remove them when necessary. There’s no one that can really argue that this meme is irrelevant. 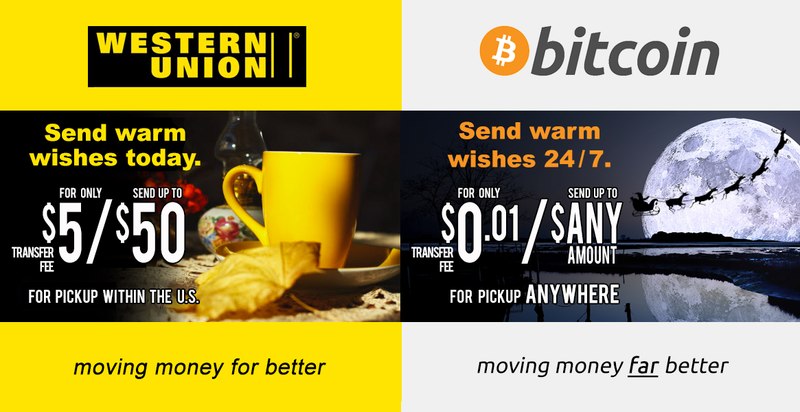 Remember when transactions were once described as cheaper than most centralized processors like Western Union? In the early days, people envisioned billions of micropayments helping people in need and third world countries. Instead throughout 2015- 2017, Core advocates and developers stated they didn’t mind if fees aggregated to $100 per transaction. Core developer Gregory Maxwell stated during the worst period of BTC’s transaction backlog and $60 fees that he was popping bottles of champagne. It didn’t matter that economically unfortunate countries couldn’t afford to use the bitcoin blockchain as long as the chain continued to remain ‘censorship resistant’ — Ironically this thought process leads to the censorship of more than 2/3rds of this world who have a hard time considering paying $0.25 cents per transaction (tx) let alone $30-60 USD per tx. It’s safe to say that enjoying the rising fee market process is straight out of a Ponzi scheme manual where only the early adopters are those who can afford to use the network benefits. Core supporters will tell you that bitcoin cash proponents are deceptive by utilizing the open brand name ‘bitcoin,’ when in fact all BCH proponents believe they are doing is “adhering to Satoshi’s original vision.” In fact, the chain and the BCH community are direct derivatives of stubborn blowback. Revisionists and actors with confirmation bias have clung to arguments that make no sense and act like the world is ready to adopt a whole new infrastructure called the ‘Lightning Network.’ This is after realizing on-chain BTC transactions are not very fast, and on-chain BTC transaction fees are unreliable especially during times of demand. Unfortunately, mainstream attention that took place during Q4 of 2017, was one of the worst periods of time for congestion, as BTC fees aggregated to upwards of $60 per transaction and confirmation times of up to a week for low fees. Then the mainstream was directed to a system that is not even close to widespread adoption, even though this mainstream audience was basically at a tipping point towards mass adoption. On April 4, a report was published that detailed major flaws and topology concerns with the Lightning Network. The author of this study was neither a bitcoin cash or bitcoin core holder. Fortunately for mainstream adopters, BCH supporters believe bitcoin cash will be there to provide the very things that were promised in the early days that made the idea of cryptocurrencies so cool — actual fast, cheap, and reliable transactions that cannot be censored. This is because BCH supporters state that mainstream audiences and users from third world countries won’t be hindered from using the cryptocurrency due to unreliable transfer times and tumultuous network fees. They also won’t have to learn to adopt a new network on top of the blockchain or learn about the flaws of routing, watchtowers, centralized hubs, opening channels, or keeping coins online in limbo. No, all they will have to learn is how to use bitcoin as it was taught for the past nine years. Mainstream audiences are also getting a glimpse of an ‘application resurrection’ of tools that were once heralded by the BTC community. The bitcoin cash ecosystem has resurrected mixers and tumblers, micro-tipping applications, a Bittorrent platform, social media apps like Memo and Blockpress, even the ability to send very small fractions of BCH without an internet connection. Bitcoin cash proponents think that revisionists will continue to try and say that Satoshi and the white paper “doesn’t matter” and will attempt to revise history to make bitcoin something that it is not. Why do BCH enthusiasts believe this? Likely it is because supporters of bitcoin revisionism have defended propaganda and censorship, so much that it has become a routine activity on some of bitcoin’s most frequented forums. All of this for a stubborn win-at-any-cost mentality that wouldn’t even allow the discussion or open debate of adding one measly megabyte to the block size. No, BCH proponents believe the confusion Core supporters complain about, rests on their conscience, because they obfuscated the protocol’s original intentions, anonymous minions sniffed out dissenting opinions, and cried when they got the blowback (the birth of BCH) they deserved. It’s safe to say that Satoshi’s vision will be remembered, and his white paper will remain safe from changes. However, BCH supporters understand that the revisionists will also be recognized for being intellectually dishonest and as sophists attempting to keep bitcoin hostage. Bitcoin cash enthusiasts believe that after August 1, 2017 bitcoin’s hostile takeover has ended, and there is now an avenue available to continue following Satoshi’s vision. What do you think about the idea that most BCH supporters believe that Core proponents have revised history and have tried to lessen Satoshi’s vision and even alter the white paper? How do you remember this history? Let us know in the comments below. Images via Shutterstock, the Future of Bitcoin Conference, Bitcoin.com, Pixabay, and Wiki-commons. Have you seen our widget service? It allows anyone to embed informative Bitcoin.com widgets on their website. They’re pretty cool and you can customize by size and color. The widgets include price-only, price and graph, price and news, forum threads. There’s also a widget dedicated to our mining pool, displaying our hash power.